Summary: Gulf World Marine Institute, Inc. (GWMI) staff responds to live stranded sea turtles along the coast of the Gulf of Mexico in Florida Panhandle. GWMI will purchase new Doppler probes and heaters that are critical in rehabilitation efforts of cold stunned sea turtles. New Doppler probes are needed for Gulf World’s current Parks Medical Electronics Doppler Flow Detector Model 811-B to assess the status of cold-stunned patients upon arrival. New heaters are needed on the pools used to rehabilitate juvenile Kemps ridley and green sea turtles; particularly during cold stun season, temperature control is vital in the success of the rehabilitation process. Results: Gulf World Marine Institute, Inc. purchased three Aqualogic EVO Titanium In-Line Heaters. All three Aqualogic heaters installed on the sea turtle rehabilitation systems. Each system includes seven individual 100 gallon Rubbermaid tubs. These heaters have already helped us continue to maintain our systems within the required FWC regulations. GWMI also purchased of a Parks Medical Electronics Infant Flat Probe for Doppler Flowmeter Model 811B and Parks Medical Electronics Pencil Probe for the Doppler Flowmeter. 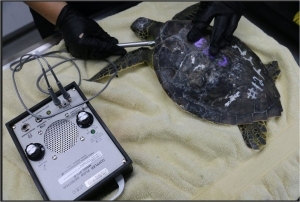 Each Doppler probe has been tested on sea turtles that have entered rehabilitation since their purchase (image at right).